Bio: Naomi has completed courses such as S1-Spinal Evaluation and Manipulation and has even contributed academically to the Physical Therapy community! She has published her doctorate thesis "Determining The Most Effective Feedback Method in Teaching Subjects to Selectively Activate the Transverses Abdominis: A Randomized Controlled Trial" in the Orthopaedic Physical Therapy Practice journal in 2014 and also presented this thesis to the APTA's Combined Sections Meeting. Naomi is trained in Pilates and enjoys incorporating this into her method of treatment. 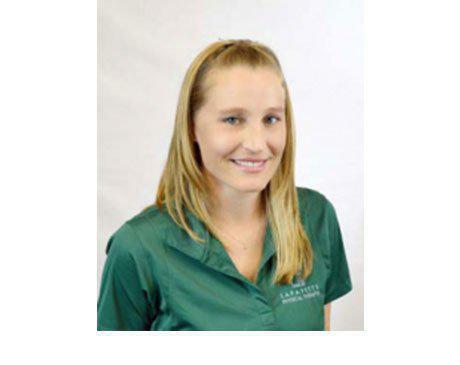 Naomi has advanced training in manual therapy techniques including spinal mobilization and Myofascial release as well as treatment for the difficult shoulder. Training: Doctorate of Physical Therapy (DPT) completed at Armstrong Atlantic State University in Savannah, GA. Bachelor of Science (BS) in Exercise Biology, UC Davis. Specialties: Naomi enjoys working with a variety of patient populations with orthopedic injuries and related dysfunctions including both operative and non-operative treatments for the spine and extremities. She believes the best rehab comes from tailoring treatments to the individual and empowering patients through education, postural corrections, and exercise to overcome injuries and help them reach their highest potential. Hobbies: Naomi is the mother of two active kiddos, Avery age 3 and Benson age 1. She and her family just recently bought their first house in Martinez Naomi was a collegiate athlete and received honors for UC Davis Division I Women's Lacrosse. She has coached high school and middle school lacrosse in Lamorinda and neighboring Berkeley. She loves traveling, running, cooking, snowboarding and taking her water-loving dog to the beach but most of all spending time with her family.